Okay, hear me out. I know I put together a quiche and a laid back playlist this month and a martini probably doesn’t fit that. In fact, the taste of this martini does not fit the quiche at all so choose your own adventure. They’re not the best pairing but I’ve been obsessed with Game of Thrones and I’m so happy it’s back on that I jumped at some cocktails I saw on DoubleNeat. Plus, every put-together gay man should have a fully stocked bar and specialty cocktails are a great way to stock the bar. 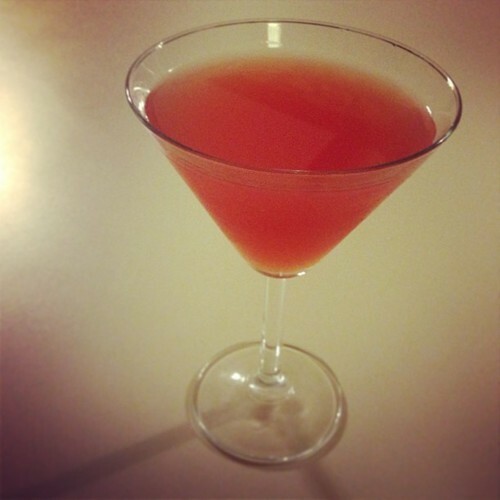 This month, I decided to make the Blood Orange Martini for Game of Thrones on Sunday. I’ve been sticking to mostly red wine these days and I thought the mixture was a little harsh. Or I’m not a fan of gin. Or I’m a little girl. I ended up having to cut the drink with some extra blood orange juice. In any case, it made for a wonderful Sunday night and I can’t wait to try a different drink next week!